I don't know about you, but I'm either freezing on the plane or sweating. There doesn't seem to be an in-between. I also have the problem with wanting to bundle up when in our room, because we have the air conditioner on and the difference between the heat outside and the temps inside are vast. I almost always travel with a blanket of some sort, or I'm scavenging for the spare blanket in the linen closet to curl up on the couch with. 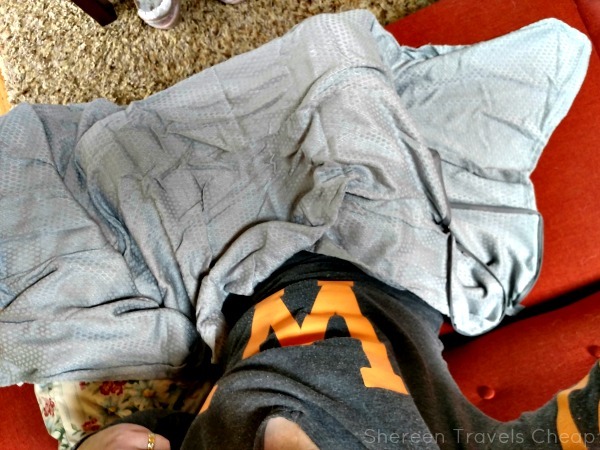 Lewis N Clark debuted their new BeWell collection at the Travel Goods Show this year and I knew that I wanted to try the new packable blanket. 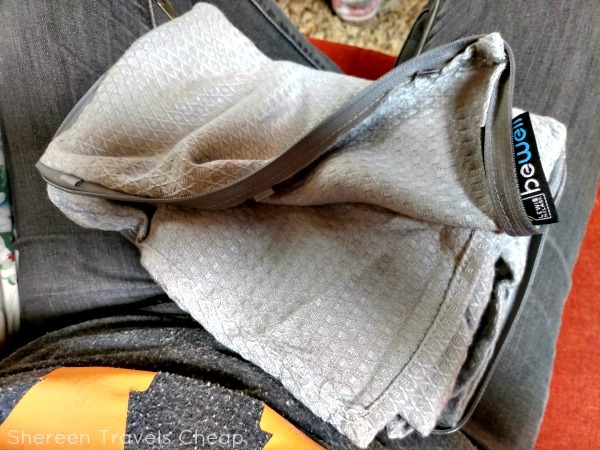 It comes in its own zip-up pocket, so it's easy to carry with you and also wrangle in your bag. It's compact when zipped up and thin. It's not going to take up a lot of space in your carry-on when you need that for other essentials. The fabric is light and very soft, but it holds in heat at a comfortable level, which can be hard to find in a blanket. Not only that, but it's made from hypoallergenic, responsibly-sourced, sustainably-harvested materials. I'm into that, because it's nice to find travel products that aren't actually ruining the world we want to see. The lightweight construction means you won't be adding much weight to your bag as well. So, if you need to carry a few of them, you won't have to worry about bulk. This isn't the largest blanket you'll find for travel. 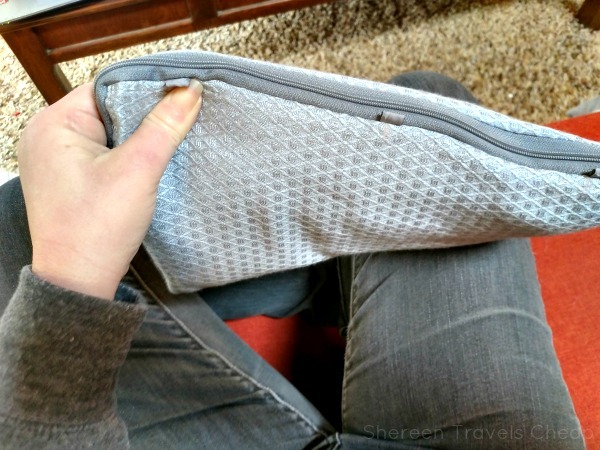 You won't be using it on the bed to use as a full layer, but it works for a lap blanket or a large scarf, and sometimes that all you really need on the plane. If your shoulders are cold, or your neck needs warming up, or your legs are chilly, you have something to cover up with. Maybe you aren't cold at all, but want to catch some Zs. In that case, you can use this blanket zipped up as a soft pillow. I was able to cover most of myself when sitting on the couch at home, how I normally curl up anyway. This blanket kept me warm and I didn't feel the draftiness of my house. This would be perfect as a full-size kid's blanket, if you travel with your littles. I'm also loving the color and texture of this blanket. It's not a boring blue, but a soft grey with a geometric weave. The weave gives the fabric a bit more area and better heat conduction and the color is pretty, but also great for anyone. Very classy and chic looking, so you'll be excited to pack it whether you're traveling for fun or for business. 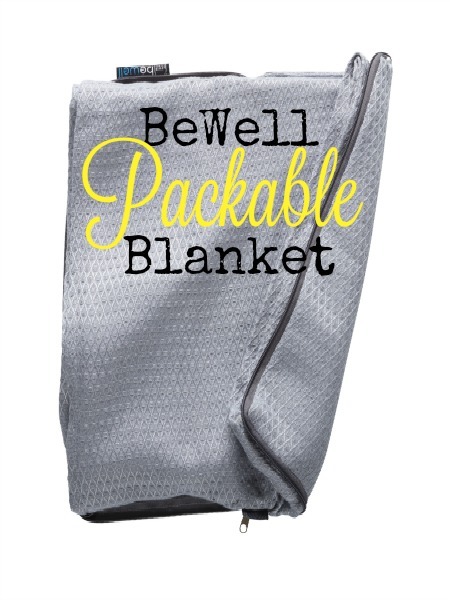 Unlike other things that are able to zip into their own carrying "case", this blanket isn't impossible to repack. In fact, it's really easy, even if you're trapped on the plane with minimal elbow room. You won't just give up and scrunch it into your bag to deal with later. I've definitely had those sorts of items and it just makes getting off the plane even harder. Also, because it zips into itself, you can't lose the bag it comes in. Convenient! I adore the direction Lewis N Clark is taking to make my travels (and yours!) more comfortable and efficient. They know exactly what you need and they deliver. I'm already packing this blanket in my carry-on for my next trip. Get one for yours as well. 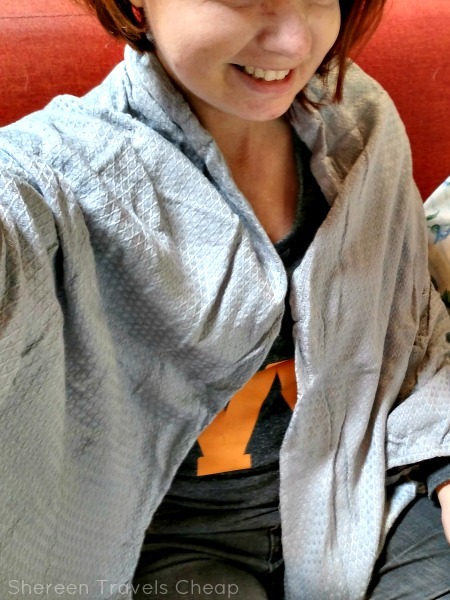 Disclaimer: I was provided with the BeWell Packable Blanket for the purposes of this review, but all opinions are 100% my own.